This Offered product is mainly used to clean wounds and manufactured by our skilled professionals using premium quality raw cotton and modern machinery as per define medical parameters. This product is highly recognized for its wound healing nature, soft texture and biodegradability etc. We are offering this combine dressing at pocket friendly costs. These medical wound dressings, surgical wound dressings are fabricated using quality raw material and can be customized as per specification of clients. Further, our range finds application in dressing where high absorbency is required to handle heavy drainage, promote healing and keep the wound dry. We use superior grade absorbent cotton in manufacturing of these surgical wound dressings to offer them in various shapes and sizes. which is a low adherent absorbent dressing. Fully-enclosed, these supple dressing are highly appreciated by our clients for their high absorption capacity. This helps in healing and caring those wounds which have heavy discharge. 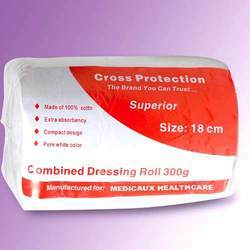 These Combine Dressings are very wound-friendly as these are gently covered with non woven material. Having the greater capacity than gauze dressing, these Combine Dressings help the wound to exudate, which is quickly channeled into the layer of absorptive cellulose. Looking for Combined Dressing ?